Barrel: 8.5" 4150V Chrome Moly vanadium steel, nitride treated and chambered in 300AAC Blackout with a 1 in 7" twist. Pistol length gas barrel is finished off with a PSA Lightweight 7" M-Lok rail, a low profile gas block, and a PSA A2 Flash Hider. Bolt Carrier Group: Bolt made of mil-spec shot-peened Carpenter 158 steel. Gas key is secured with grade 8 fasteners and staked per mil-spec. Build Kit: A high quality lower build kit with everything you need to assemble your AR-15 lower into a pistol. Features Enhanced Polished Trigger (EPT), Magpul MOE+ Grip, Magpul Trigger Guard, and black oxide coated hammer and trigger springs. Also includes SB Tactical SBA3 Adjustable Pistol Brace, castle nut, latch plate, carbine buffer spring, 5 positioning mil-spec buffer tube, and standard carbine buffer. BEST ANSWER: With the birdcage still on mine is a hair under 24.5 with brace closed and 27 extended. The upper is 17.25 alone and lower is 14.5 closed. Will this function with subsonic Ammo? Why 1:7 twist, aren’t all the others 1:8? BEST ANSWER: Eddie, Some people say that the 1/7 twist rate is better for stabilizing heavier 300 blkout rounds (210-230gr). Some reviewer report that slower velocity (1100fps) heavy 300 blkout rounds are not stabilized by the 1/8 twist rate and will begin to tumble in flight. I have not fired it myself, just repeating the YouTube gods. 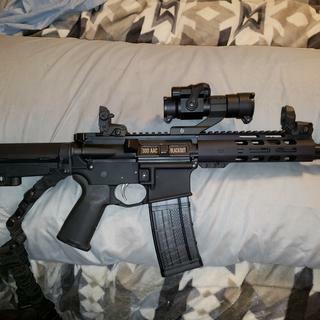 hello i can use any stripped lower for AR15 to complete this kit ? 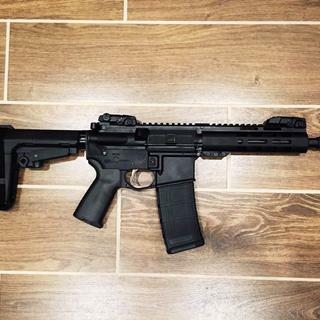 Would This Be a good upgrade for the smith&wesson Ar15 Sport? BEST ANSWER: Depends...... this is technically a Pistol upper, it needs to go on a Pistol lower, if you put it on a rifle lower theb its considered a SBR and thats illegal unless you have a tax stamp and paperwork for that. will this shoot supersonic rounds without issue? Does this kit come with instructions on how to assemble the lower receiver parts to a lower receiver? BEST ANSWER: No, but you can easily look up a video on youtube on how to assemble. It's very easy and you only need common tools. 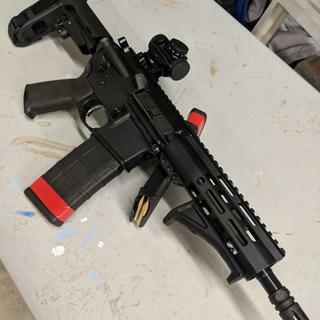 I am wanting to install the Pantheon Arms/Dolos barrel takedown system on a 300BLK pistol, will it work with your handguard? BEST ANSWER: The dolos system requires a threaded hand guard. Yankee Hill rails have the same thread. I built exactly what you are thinking of and it is great. Will an H3 buffer work with both Super and sub sonic ammo? I love this pistol kit! It just looks and feels so cool, something James Bond would use. Only thing I changed was h3 buffer, BCM extractor spring and charge handle, BAD lever, red Dot and started dumping subsonics like a champ! Might go suppressed some day who knows. Nice kit but the handguard isnt on straight....gonna be rough on iron sights. I haven’t shot this yet, so this is just my initial impression. First, this kit is a really good deal for $329. I have dealer accounts at several online retailers and even with my discounts I could not assemble a parts kit like this for the price PSA is selling this for. 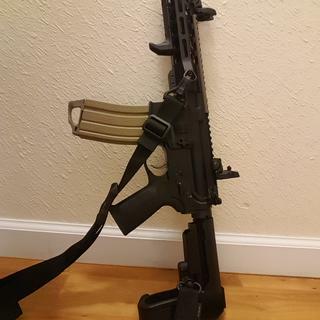 I was initially only going to buy an upper and had already ordered a SBA3 brace, a K2 grip and everything else I would need. When these went on sale I changed my mind since I will use everything eventually. Paying the extra $60-80 premium for the entire kit vs just an Upper was a no brainer. It is evident why the upper is sold at a budget price when you look at it. The finish inside the upper is a little thin compared to a premium upper and the rail is obviously a budget part. That being said everything is well finished. The rail is solidly attached and has integral anti-rotation tabs. Since most premium rails sell for over half the price of the kit, this is acceptable. The only reason I’m taking off a star was that it was immediately apparent that the gas block is significantly canted. The gas tube is well centered though and doesn’t bind in the gas key. Overall I’m not sure if it’s just the gas block or the entire barrel assembly that’s canted. The Upper was obviously test fired, so I’m guessing it functions. If it does I’ll probably leave it alone. So, my only complaint is PSA should have a little more care during assembly. Overall these are a great deal. If you are on the fence about trying .300 BO, you can’t do it cheaper. I’m glad PSA is offering 1:7 barrels and I’d like to see this across the board in their .300 offerings. This is an awesome build kit. However, I did have to dock a star for 2 reasons: there was a very aggressive machining edge on the bolt catch big enough to where it would not seat in its spot in the lower receiver. Had to take it to a bench grinder to grind down the excess metal (Pictures to come). Also I ordered the kit on a Friday and it didn’t even ship out until the following Wednesday. Aside from these small issues, I put about 50 rounds through my pistol so far (utilizing a “no step on snek” lower receiver from PSA) and not a single issue functioning so far. Used armscor 147 gr ammo along with some of my 125 gr hand loads. Locks back on empty mag and has a very stead 4 o’clock ejection pattern. Fit and finish are also very good. Overall, definitely worth buying. I had an extra lower and saw this kit and decided to pick it up. It's really nice! I was surprised with how well the enhanced trigger feels. You can tell a difference with it being polished. I usually change them out, but I might try this one for a while. Overall this is a great bang for your buck. I wanted to add another 300 BLK to the collection and this fit the bill. Can't wait to take it out! Bang for the buck kit!! Great kit for the money! 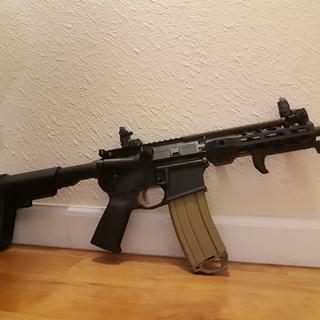 Assembled my lower, slapped the upper on and away I went! Took my wife up the mountain to try it out after I gave the pistol a generous amount of lube being brand new. Functioned flawlessly! Not a hickup in the gitup lol! Put an instant smile on my wife's face and she was no longer mad lol! I live in oregon and it took almost exactly a week to receive in the mail! Probably one of the funnest ars I have! Not a lot of flash or excessive noise being 300 blackout. Can't go wrong with PSA. Their supplied trigger does seem better than a stock mil spec. Overall very satisfied! 300 rds so far %100 reliable!